The Network Search allows administrators to transfer members from one Club to another. When a network search request is 'approved' the member record will move from one Club to another, thus maintaining a single record. Transactional history will however remain in the original Club. Please Note: the Club to which to member would like to move to is responsible for 'requesting the transfer'. 1. Within the Management Console, select Members from the top menu, then Network Search from the left menu. Competition Number: will be titled to your Organisation's name for Competition Number. 3. Once you have completed these fields, click Search. This will bring you a list of all possible members that match your search criteria. 4. If you want to request a transfer of a Member from here, find the Member that you wish to transfer and click on the Transfer button next to that Member. Additional Information: Network Search will allow you to find any member that is attached to your Club or Sport. 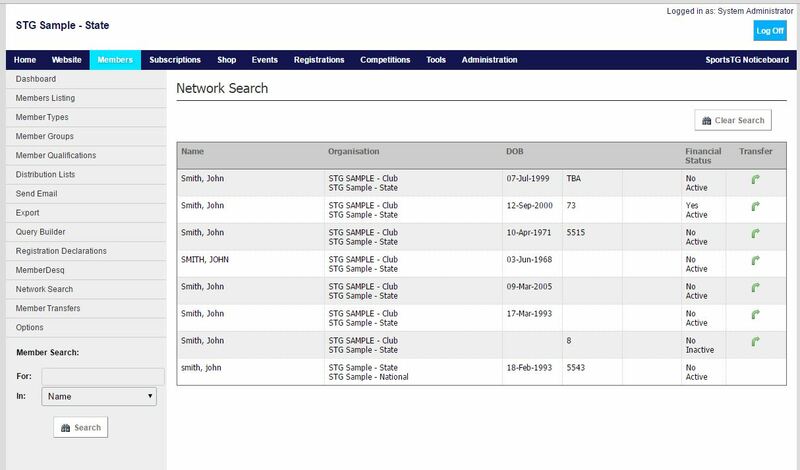 The Network Search allows you to transfer that member to your club, avoiding duplicate member records in the database and keeping all of their Members History.